INDIANAPOLIS, Ind. (WTTV) – Fidget spinners have become a must-have toy for many central Indiana children, but they may be more dangerous than parents realize. Some of the parts are very small and could pose a choking hazard if they pop off, as a Decatur Township firefighter discovered this week. The firefighter shared his story on the department's Facebook page Thursday. He said his daughter was in the backseat spinning the fidget when one of the metal bearings broke off, flew into her mouth and got stuck in her throat. The firefighter performed back blows in an effort to get the part to come out, but his daughter eventually swallowed it. "I did about five minutes of back blows and with her coughing, it became dislodged and went to her stomach," the firefighter wrote. The firefighter called 911, and his daughter was treated and released at an area hospital. The department posted a photo of the fidget spinner with the piece missing as well as an x-ray showing the part in the girl's stomach. "Thankfully this turned out well, but please be aware that it can be a choking hazard," the Decatur Township Fire Department wrote on its Facebook page. This isn't the first time this has happened. 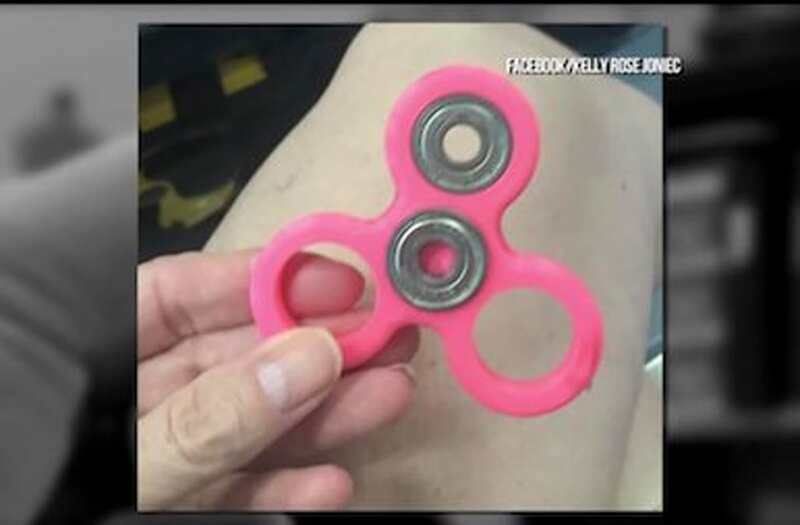 A Texas mother said her 10-year-old also nearly choked on a fidget spinner part. Doctors found it stuck in the child's esophagus and removed it. Boxes for the toys do clearly state that there's a possible choking hazard and warn that they are not suitable for children under 3 years old. If your child has one of the toys, it's a good idea to check the metal bearings periodically to make sure they're secure.